This is an introduction to Thomas Ray Allen. The other posts during the A to Z Challenge will expand on details mentioned here. Thomas Ray Allen was born into slavery about 1845 on Foster Ray’s plantation in Lebanon, Marion County Kentucky. Thomas’ mother, Clara was sixteen years old. His father’s name was Louis Allen. Two years later his sister Sarah was born and two years after that his sister Annie (my great grandmother) was born. 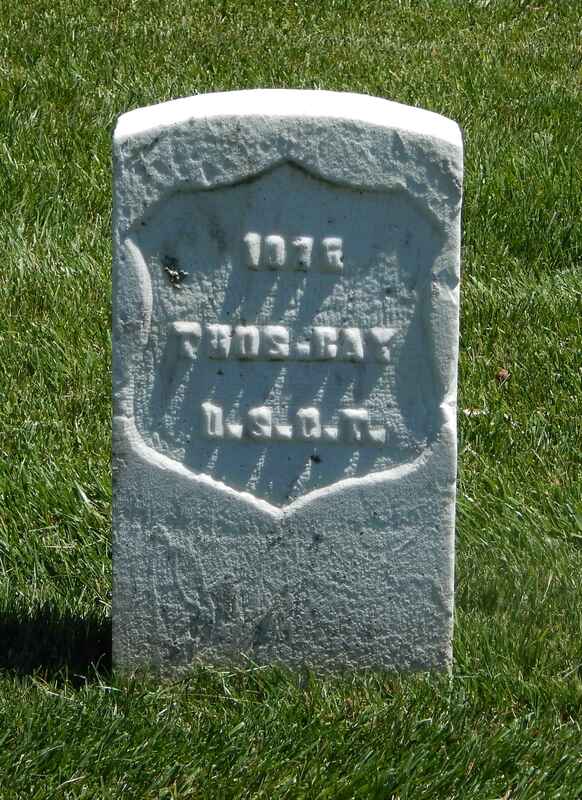 Slave holder Foster Ray was a farmer/merchant with lands in Kentucky, Missouri and Illinois. Foster died in January 15, 1863 leaving everything to his wife Marietta Phillips Ray and his nephew Nicholas Ray. Unfortunately there is no probate list naming the enslaved. 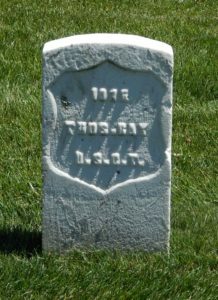 On August 15, 1864 Thomas enlisted as “Thomas Ray” in Company D, 5th Regiment of the United States Colored Troops – Calvary in Lebanon Kentucky. He was 18 years old, 5 ft 5 in. with black hair, black eyes and copper complexion. Occupation given as “farmer”. On March 25, 1865 Thomas was appointed bugler. The bugler’s job was to sound directions to the troops when there was too much confusion and noise for the commanders to issue orders by mouth. On Thomas’ enlistment papers Addison Taylor of Marion County is listed as his slave owner, however in his pension file Thomas says several times that Foster Ray was his only former owner. Foster Ray and Addison Taylor, who lived in the adjoining counties of Casey and Marion Kentucky, were cousins. From March 14 through 18 Thomas was relieved from duty after falling from his horse and receiving a concussion. On March 19, he was returned to duty as they found nothing else wrong with him. On August 15, 1866 Thomas was mustered out in Helena Arkansas, along with the rest of his regiment. He returned to Lebanon Kentucky and in the 1870 census was living with his younger sister Sarah Ray Primus, her husband Felix and their young children. Felix and Thomas were both laborers. On 9 March 1871 Thomas Ray and Georgiana McDougal (aka Martin) were married in her home county of Larue, Kentucky. Her older brother Thomas MacDougal had also served in the USCT, although he was part of a different company. Thomas Ray appears in the Indianapolis City Directory in 1877 as a hostler, a stableman who cares for horses. In January of 1878 he and his first wife Georgiana were divorced. About 1879 he was introduced to the woman who would be his second wife, Katy Wiley by a mutual friend, Lottie Sullivan. About this time Thomas decided to stop using the surname “Ray”, his former enslaver’s name. He began to go by his father’s surname, “Allen”. He explained his choice in his Will here, Thomas Allen – Last Will and Testament. 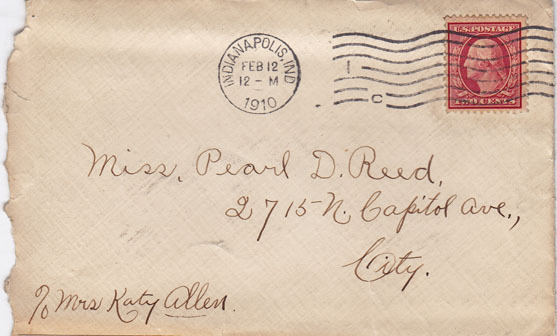 Finding this envelope addressed to my grandmother C/o Mrs. Katy Allen sent me on a search to find out who Katy Allen was and from there to discover my USCT Uncle Thomas Allen. Thomas Allen and Katy Wily were married by Rev. Jacob R. Raynor, a local Baptist minister on March 5, 1880. In 1887, they were living in the cottage at 2157 N. Capital, which they bought and lived in until his death in 1907 and Katy’s move back to Ohio near the end of her life. By 1887 his niece and nephew, George and Sallie Reed, had moved to Indianapolis. They were soon followed by their mother, his sister Anna Reed and the rest of her family by 1894. They shared his home for several years. In August of 1890 Thomas was 45 years old and approved for a military pension of $12 a month due to total deafness of the right ear and disease of digestive organs. In 1894 his pension was inexplicably dropped to $6 a month. Over the next 13 years he fought to have it raised to at least $8 a month, to no avail. He was examined by doctors who documented his deteriorating health. Family members, former United States Colored Troop members and friends from throughout the years testified regularly that he was who he claimed to be, and that Thomas Ray and Thomas Allen were one and the same. The also testified that he was ill and debilitated. Because this was long after slavery was over and he was living far from the place where he had been enslaved, nobody from the same plantation testified for him. In 1904 the doctors found him to be suffering rheumatism, chronic diarrhea and disease of the stomach. His pension remained at $6. By 1906 Dr. John W. Norrel gave evidence that Thomas’ ailments made it impossible for him to support himself. By July 1907, the medical testimony declared that he was in much worse shape and would not last much longer without some relief. At age 60, on September 16, 1907, Thomas Allen died at home in his own bed. He left his wife to apply for a pension as a surviving widow, which she did successfully. Neither he nor she had any children. In the 1910 census, Katy Allen was living in the same house and doing laundry to supplement her pension. She died in 1915. It still amazes me that every one of the folks you write about could be the star of their own movie. I keep imagining the details in between the big life events, but it sounds like this time you I’ll be filling them in yourself! I continue to be amazed by your posts and the amount of research you must have done to create a post like this. I feel almost that I knew this man. Me too! After spending so much time researching him and his community, I feel like I know him too. What an incredibly moving story! And how wonderful to have an explanation in Thomas’s own words of his name change. Excellent research on him and his family. Thank you Molly. I loved finding his explanation of the name change too. Finding the comments that he made himself and that other’s made, was a very special part of reading his Pension File. What an amazing life he must have led, it sounds like he had quite a hard life as well. It sounds like the last decades were very hard as his health failed and he couldn’t get any increase in his pension. One would say this is a simple life, with very normal events. And still I find it so fascinating. It isn’t always possible to find so many details, normal details for lives of my ancestors. His pension file was so helpful in bringing his life alive. Amazing history. His statement, including the words “my true and correct name,” carry a ton of weight. I look forward to the rest! I felt quite proud of him for doing that and expressing himself so well. Wow, that is a well documented life… it is kind of sad that having changed his name from his owner’s to his father’s could still cause all those problems years later…. It didn’t really cause problems because he straightened it out before his death. He still had witnesses around who could testify that he was the same man and after he died, his widow was able to receive her survivors pension with no problem. I love hearing about the lives of ‘ordinary’ people. Looking forward to more of your posts! Whst a sad way for Thomas to die, still fighting the authorities for his true pension and you have given us a detailed and poignant profile of his life. How heartbreaking that after all those years fighting for an increase in his pension he wasn’t granted it. So much good information in this post. I look forward to learning more about him. It is sad he fought hard for his increase in pension and was denied. It seems the sicker he became is when the Pension Board decided to make the decrease. Makes no sense to me, but that is exactly what happened. Some people fought for 20 years to get their pension. So many more didn’t make it that long. I have been reading your posts as you publish them but thought I would go back an re-read to get the story straight. The migration is fascinating. It is 180 miles from Lebanon Kentucky to Indianapolis. Following on from a comment made on your next post but relevant here as Thomas also enlisted, I guess the term “enlisted” makes one think it was potentially voluntary. We sometimes distinguish by saying “was conscripted”. There is nothing in the words definition that implies enlisted is voluntary or otherwise, I guess the prejudice is based on how we often use it nowadays, for example “he enlisted our help”. I am not clear how recruitment would have occurred for men like Thomas . Would the Ray family have made him? It was voluntary. On his military record it says he joined without permission. At the beginning of the war black men could not sign up at all. 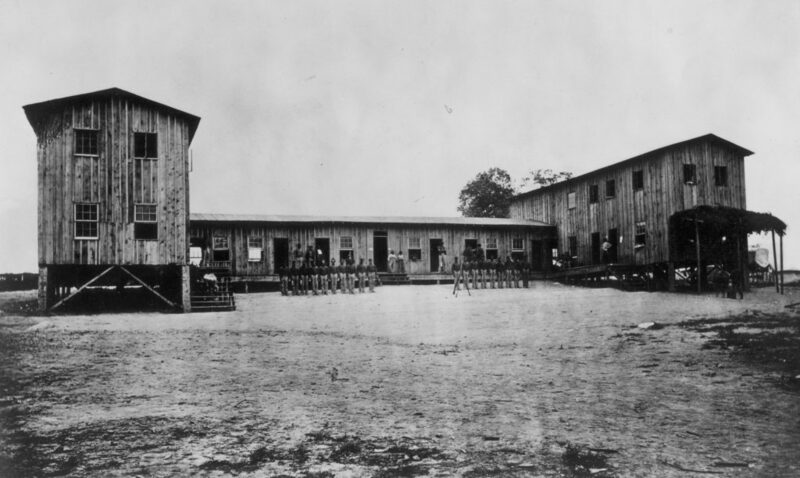 I am going to write more about the United States Colored Troops and how they functioned when we get to “U” – that would be Tuesday. Whew!